Composed by William Neil. Contemporary Classical. Score. 61 pages. Published by TheComposerStudio.Com, LLC (S0.347139). The music makes dramatic shifts between the E-flat clarinet’s high virtuous technical flights and its mystical, expressive qualities. 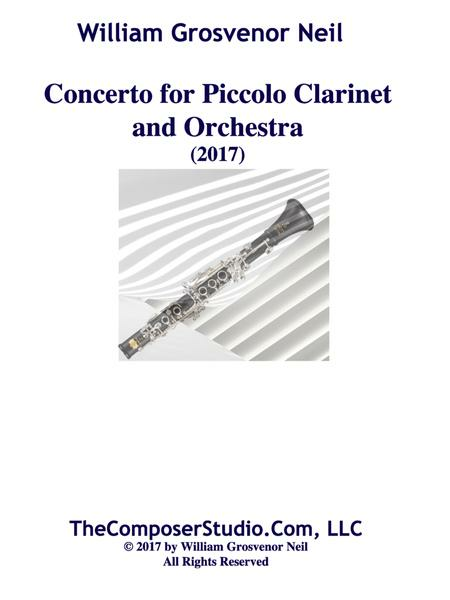 The sound resources for entire work are entirely derived from the clarinet’s opening descending line that quickly develops into a succession of firey cadenzas. The soloist then leads the ensemble in a highly spirited dance of counterpoint and rhythm. Listen to clarinetist Fàtima Boix Conto's performance on youtube: https://www.youtube.com/watch?v=WEGgIBeyUHQ Click here to order parts: http://williamneil.net/shoppingcart/ Information on the composer: www.williamneil.net .